If you’ve spent more than 10 minutes in Madison, you know that it’s undergoing a culinary renaissance, rivaling many big cities while still keeping the experience accessible and local. We’re always happy to talk about dining recommendations with guests upon arrival and during their stay based on individual tastes and overall plans. Below is a sampling of a few of the restaurants we consistently recommend. To learn more about all our fair city has to offer, or to scope out food and beverage events throughout the year, visit our Madison events calendar. The Green Owl Cafe, 1970 Atwood Ave, near east side Madison. Madison’s premier vegetarian and vegan restaurant with options for meat-eaters as well. Monty’s Blue Plate Diner: Located at 2089 Atwood Ave, near east side Madison. Quintessential neighborhood diner serving from-scratch meals using local ingredients along with great malts and a large vegetarian selection. Alchemy: 1980 Atwood Ave, near east side Madison. Unassuming and genuine with some of the best burgers in town along with vegetarian and vegan options. Tipsy Cow: 102 King St, on the Capitol Square. Throw your guilt aside and enjoy scrumptious truffle fries, Spotted Cow beer battered fat onion rings, and local-sourced lamb and beef burgers along with an excellent assortment of other sandwiches. A Pig in a Fur Coat: 940 Williamson St, near east side Madison. Mediterranean comfort food reflecting some of the best flavors of Spain, France and Italy. Graze: 1 S Pinckney St, on the Capitol Square. An eclectic menu featuring a range from pub-style classics to globally-inspired favorites. Heritage Tavern: 131 E Mifflin St, one block east of the Capitol Square. In an old-world ambiance, Wisconsin’s finest ingredients meet global inspiration, culinary excellence, and expertly-crafted cocktails. Forequarter: 708 E Johnson St, one block from The Livingston Inn. 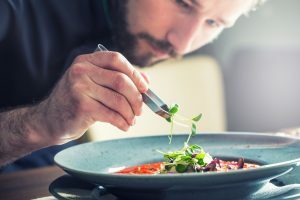 Inspired, creative, and unique cuisine with daily seasonal menu, small plates, craft cocktails, and excellent late-night menu. Graft Madison: 18 N Carroll St, on the Capitol Square. Midwest-inspired small plates with local ingredients and thoughtful pairings with amazing wines and very welcoming hospitality. Estrellon: 313 W Johnson St, downtown Madison. Simplistically-beautiful composed dishes perfect for sharing, flavorful cheeses and charcuterie, and incredible Spanish wines. Eno Vino: 1 N Webster St, one block from the Capitol Square. Bruschetta, cheese boards, flatbreads and much more with some of the most stunning views in Madison. Robin Room: 821 E Johnson St, two blocks from The Livingston Inn. Savor amazing flavors inspired by some of Madison’s leading innovators in craft cocktails. Ale Asylum: 2002 Pankratz St, four miles east of The Livingston Inn. A leading local brewery featuring a tasting room and dining menu. Karben4: 3698 Kinsman Blvd, four miles east of The Livingston Inn. A start-up brewpub that continues to grow in popularity while keeping itself uniquely Madison. Old Sugar Distillery: 931 E Main St, near east side Madison. Whiskeys, rums, and special liqueurs with a tasting room and patio in a specially undiscovered spot on the near east side. Bos Meadery: 849 E Washington, near east side Madison. Discover the essence of the flora of Wisconsin in drinkable form with the world’s oldest fermented beverage. La Kitchenette: 805 Williamson St, near east side Madison. Featured in one of our blogs, a French homestyle cafe with fresh soups, salads, tartines, quiche, and crepes. Monsoon Siam: 2045 Atwood Ave, near east side Madison. Thai cuisine featuring pure flavors and quality ingredients all homemade in a friendly neighborhood restaurant. Ha Long Bay: 1353 Williamson St, near east side Madison. An extensive menu featuring the flavors of Vietnam, Thailand, and Laos. The Coopers Tavern: 20 W Mifflin St, on the Capitol Square. Great beer selection and a menu designed to soothe your soul inspired by travels around the world. Lombardino’s: 2500 University Ave, near west side Madison. True Italian cuisine with a seasonal menu and named one of the top five Italian restaurants in the state. Osteria Papavero: 128 E Wilson St, downtown Madison near Capitol Square. Seasonal Italian fare with an emphasis on wild game featuring delicious entrees, panini, soups, pasta, and an extensive wine list in a cozy restaurant. Tornado Steakhouse: 116 S Hamilton St, downtown Madison near the Capitol Square. Like a step back in time but beautifully restored, discover Madison’s premier steak house offering white-linen dining in a supper club atmosphere. The Old Fashioned: 23 N Pinckney St, on the Capitol Square. Featuring a menu inspired by the traditions of Wisconsin taverns and supper clubs and a passion for local specialties from small Wisconsin producers. Salvatore’s Tomato Pies: 912 E Johnson St, two blocks from The Livingston Inn. Farm-to-table pizza with fresh antipasti and excellent salads. Grampa’s Pizzeria: 1374 Williamson St, near east side Madison. Artisan thin-crust pizza, wine, craft beer & desserts served in a cool spot with an herb garden. Stalzy’s Deli: 2701 Atwood Ave, near east side Madison. Bacon supplier for The Livingston Inn! Based on technique and tradition, hand-crafted food using Wisconsin cheeses, house-baked bread and quality meats that are cured, smoked and roasted in-house. Tempest Oyster Bar: 120 E Wilson St, downtown Madison near the Capitol Square. Fresh and sustainable seafood restaurant featuring live Maine lobster, Friday fish fry, oysters, and Saturday prime rib. Sardine: 617 Williamson St, downtown Madison on Lake Monona. Bistro-style dining featuring French and American cuisine including seafood hors d’oeuvres and unique dinner options. Restaurant Muramoto: 108 King St, downtown Madison near the Capitol Square. Extraordinary Asian fusion with sushi, salads, and unique entrees along with an extensive Thursday to Saturday late-night menu. Babcock Ice Cream: 605 Linden Drive, UW-Madison campus. The creamery is home to quite possibly the best ice cream on earth. Go grab a scoop (or three), and tell them The Livingston Inn sent you! Chocolaterian Cafe: 2004 Atwood Ave, near east side Madison. Famous for its “ugly cookie” and the home of Christine’s Gourmet Toffee.